Today's outfit features just about the easiest redo you can do. 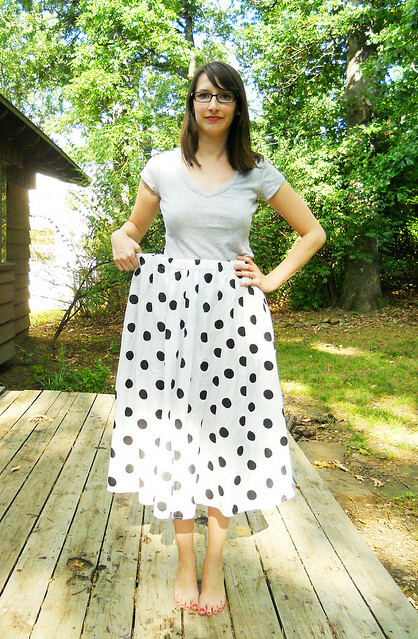 Resizing an elastic waist skirt. I found this skirt at my local thrift store. It was hanging in the plus size section, a place I don't usually browse, but with a pattern like this, how could I miss it? Despite being an XL, it's XS price tag ($2.50) convinced me to bring it home. I took a pair of scissors to the seam at the back of the waistband, pulled the elastic out until I had a good fit, cut the excess elastic and sewed the ends back together. I didn't even bother to stitch the seam back up. I'm tempted to try this skirt with the crinoline I wore for my wedding. Too Betty Draper? I'll announce the winner of the eShakti giveaway later today.